Initiative – University of Rome “La Sapienza”, one of the most ancient Italian Universities and the biggest one in Europe, launches the call for papers for an international Conference in History and Political Science “The Great War. 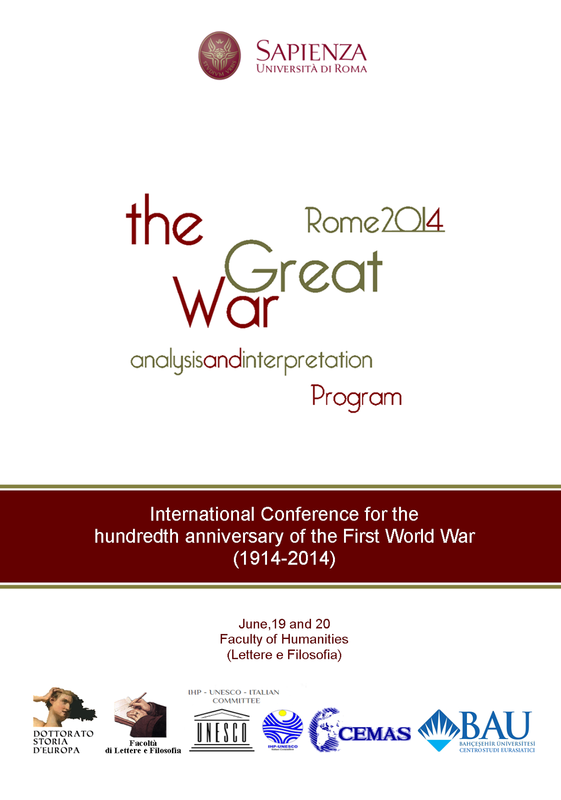 Analysis and Interpretation”, which will be held in Rome on June 19th - 20th, 2014. Aim - The Conference aims at encouraging a new debate on the theories and reconsidering traditional academic cliché, thus welcoming less studied topics regarding the Great War. Modality - Program contains both six plenary sessions and thematic sessions structured in panels, with chair, discussant and at least three speakers in each. Participants will present and discuss their contributions correlated to research themes of high scientific relevance, about the topic of the conference. Method - The scientific approach, promoted by the Conference Organizing Committee is characterized by internationality, interdisciplinarity and conviction that only combining different disciplines and efficient research methods will allow us to reconstruct various aspects and facts of the Great History. In this perspective Scholars and researchers in History, Political Science, Economics, Sociology, Strategic Studies, Geopolitics, Geography, Literature and other fields correlated to the topic in of the Conference, are warmly welcome to participate. Topics - Particular attention will be given to the ideological debate, the use of propaganda, the evolution of the “war-phenomena”, the issues of the military history, political and social consequences of the conflict, its perception and evolution in popular culture, as well as to the heritage of the Great War in contemporary foreign politics. Sessions - For the reasons stated above, the Organizing Committee encourages submitting applications, and once analyzed and approved by our scientific committee, will be scheduled in appropriate sessions. 6 The fourth year of the war: entrance of the United States of America, Bolshevik revolution, the social impact of the great offensives.